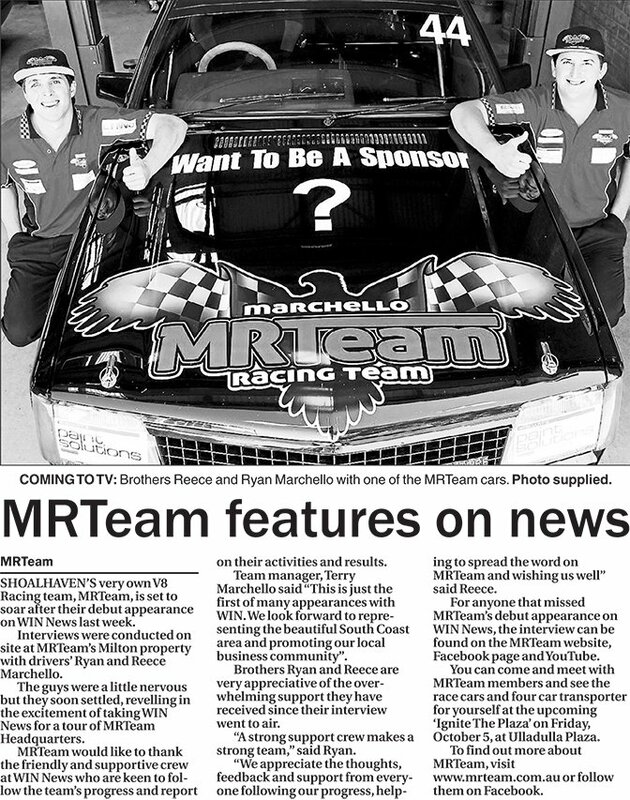 SHOALHAVEN’S very own V8 Racing team,MRTeam,is set to soar after their debut appearance on WIN News last week. Interviews were conducted on site at MRTeam’s Milton property with drivers’Ryan and Reece Marchello. The guys were a little nervous but they soon settled, revelling in the excitement of taking WIN News for a tour of MRTeam Headquarters. MRTeam would like to thank the friendly and supportive crew at WIN News who are keen to follow the team’s progress and report on their activities and results. Team manager,Terry Marchello said “This is just the first of many appearances with WIN. We look forward to representing the beautiful South Coast area and promoting our local business community”. Brothers Ryan and Reece are very appreciative of the overwhelming support they have received since their interview went to air. “A strong support crew makes a strong team,” said Ryan. “We appreciate the thoughts, feedback and support from everyone following our progress,helping to spread the word on MRTeam and wishing us well” said Reece. For anyone that missed MRTeam’s debut appearance on WIN News,the interview can be found on the MRTeam website, Facebook page and YouTube. You can come and meet with MRTeam members and see the race cars and four car transporter for yourself at the upcoming ‘Ignite The Plaza’on Friday, October 5, at Ulladulla Plaza. To find out more about MRTeam,visit www.mrteam.com.au or follow them on Facebook.